Stade du Roudourou belongs to Ligue 1 minnows En Avant Guingamp where they play their matches for crowds up to 18,250. Although opened in 1990 (making it modern compared to other stadia cross Europe), there are plans to renovate the away fans stand with a covered roof in order to shelter the whole ground from the elements. 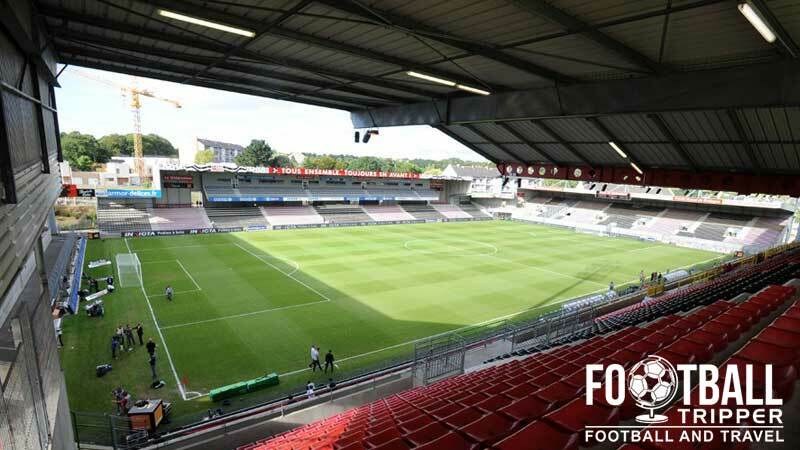 EA Guingamp have resided at Stade du Roudourou for nearly a quarter of a century having moved into the ground on in 1990, with an inaugural match held on January 21st against Paris Saint-Germain. The Roudourou was built on the site of the dilapidated Stadium Montbareil also known as Stade Tyves-Jaguin which had previously hosted Guingamp and local side Stade Charles de Blois. The initial capacity was set at a modest 12,000 but following promotion to Ligue 1 and qualification for European football it was deemed inadequate. The first wave of renovation which started in 1995 added two new stands (East and West) and the second wave in 2007 installed a roof over all stands and improved changing room facilities. The town of Guingamp and Stade du Roudourou has been unlucky not to benefit from both the 1998 World Cup and 2016 European Champions hosted by France, as many stadiums across Ligue 1 have received substantial investment such as Marseille’s Stade Vélodrome, Lyon Stade des Lumières and PSG’s Parc Des Princes. For now the stadium is content to just host EAG football matches, although it had a taste of International football when the national team played Faroe Island at the ground in 2008. The Roudourou is comprised of four stands: Tribune Patrick. 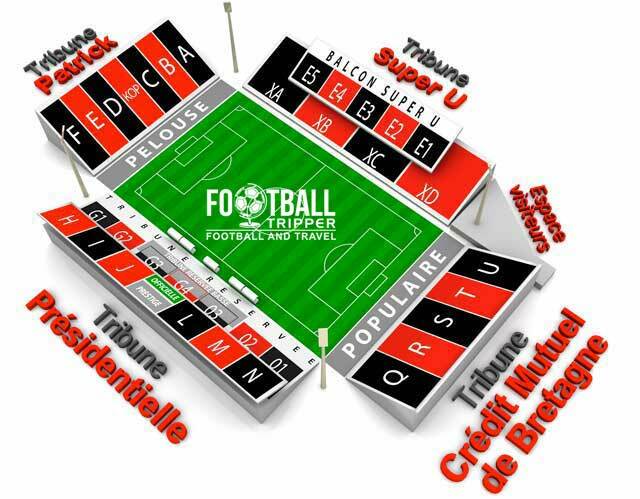 Tribune Super U, Tribune Credit Mutuel de Bretagne and Tribune Presidentielle. Away fans who make the trip to Stade de Roudourou are by default housed within the north-east corner in a small stand which resembles a pillbox. If the travelling contingent is expected to be larger then additional sections of seating are given to the away fans either side of the corner meaning fans sit within the eastern-goal end and northern tribune stands. 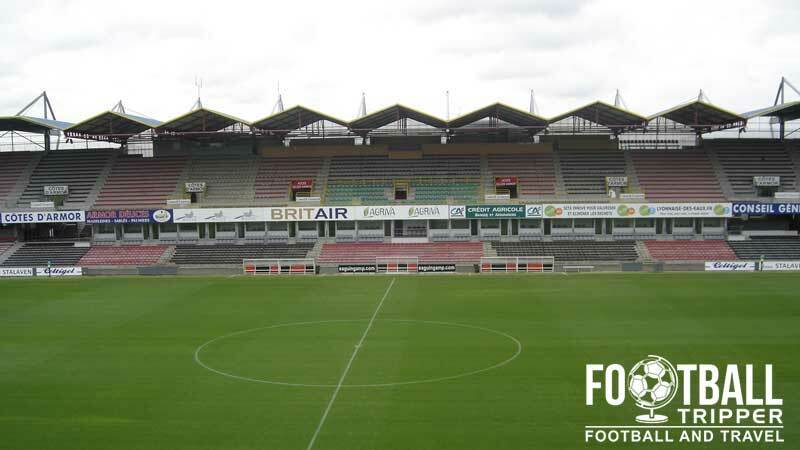 Stade de Roudourou is located to the Northwest of the city centre but isn’t particularly far out meaning you are well placed to take advantage of the many restaurants, cafes and bars within Guingamp. The map below outlines some of the most football friendly places to drink at. Drinks wise, cider is on the menu with Brittany a huge manufacturing region. For the lazy there is a McDonald’s around 10 minutes West of the Stadium along Rue Auguste Brizeux with every other option seemingly back towards the centre ville. If you stick with the main road where McDonald’s is and head East/South you will come across the traditional French restaurant La Casa, Pizza Mando and the popular Le Grain de Sable. En Avant de Guingamp operate two shops according to the official website in addition to an official online boutique. The main club shop is the one at the stadium which is on 1 rue St-Nicolas. 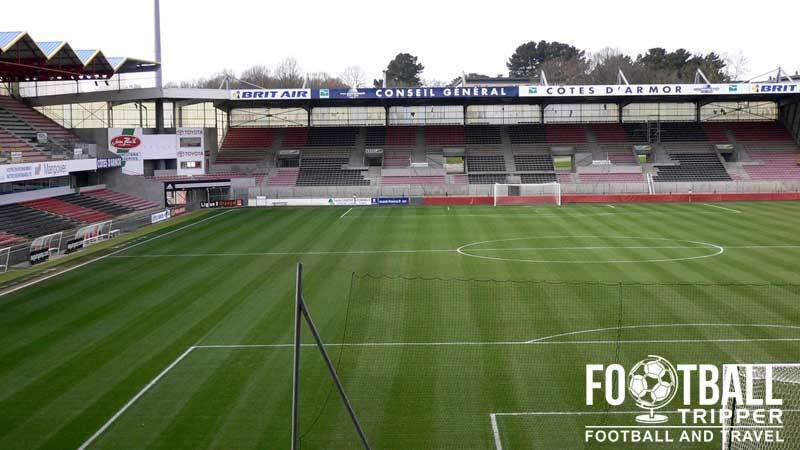 As a smaller stadium constructed over 25 years there really isn’t much to see, and it’s no surprise that Guingamp do not currently offer Stadium tours of Stade du Roudourou. Tickets to see EA Guingamp play can be purchased online or in person at either of the stores in the city, in addition to the other ticket sellers found throughout Guingamp such as Francebillet and Ticketnet. The club rarely sell out their home matches meaning you should be able to chance your arm and purchase tickets in the days leading up to the match but this does depend on who the opposition is. Price wise, tickets start at €11.00 for a seat in one of the Curvas behind the goal and around €25.00 for a reasonably good seat in the main stand of the Stade. For high profile matches add an approximate €5 premium. 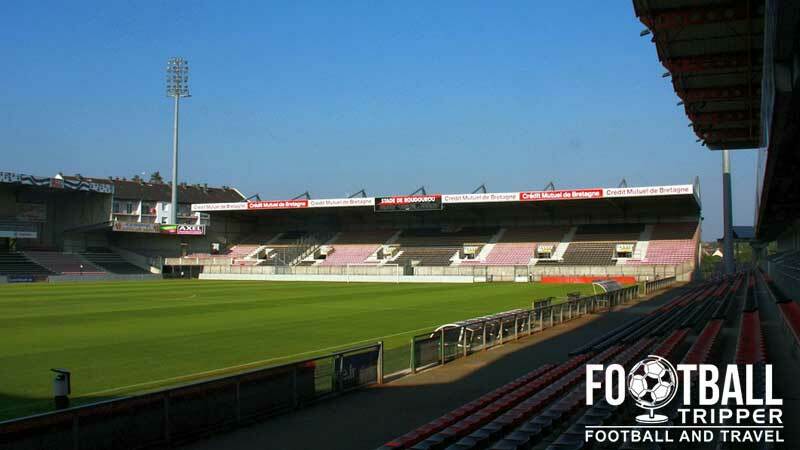 Stade du Roudourou EAG can be found in the North West quadrant of the city of Guingamp and due to the city’s smallish size, it is only around 1.5 km away which is handy for football fans. Located in the North West of France, Guingamp isn’t the most accessible city for the entire of Europe but it does have road links to the rest of the country via the E50, N12 (East and West) and D9 (North East). There are two medium sized car parks located outside the stadium, one behind the east stand, and one to the south. Make sure you get there early! The main train station of the city Gare de Guingamp is located in the South East of the city, diagonally opposite if Stade Roudourou and is approximately 2.3km or 30 minutes away by foot. From the train station and other places around town you can catch either Bus number 2 or 3 to the stadium, with frequent bus services on match days. The closest airports to Guingamp is Lannion-Côte de Granit Airport but it doesn’t appear to offer much European or International flights. Some suggest that Quimper Cornouaille Airport over 130km away is the closest airport which flies to the UK, but even then this doesn’t seem very practical. We await further information on what the most convenient airport is. As a small city with a population around 7,500 there really isn’t many hotels to choose from with nothing located in the immediate vicinity of the Stade du Roudourou EAG. This isn’t an exact necessity as the city is small, but it is always good to check out how close you can stay to the stadium to gauge how much travelling you’ll have to do once you are there. Close to the main station, Brit Hotel Armor and Inter-Hotel De L’arrivee are two cheap and cheerful choices that might be worth looking at.